Joe and Pauline Boyle are qualified therapists and hypnotherapists practicing in North Belfast. Boyle Therapy is a member of the Clinical Hypnotherapy and Psychotherapy Association and provides help on a wide range of subjects including quitting smoking, weight loss, happiness, personal and business coaching. 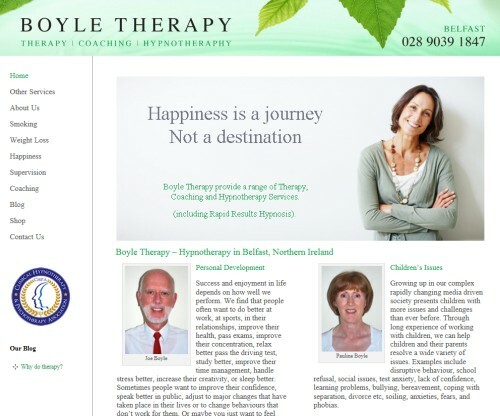 We produced a website for Boyle therapy at http://www.boyle-therapy.co.uk which will be easy for the client to maintain, adding news items and being able to change information on the site anytime he wishes.